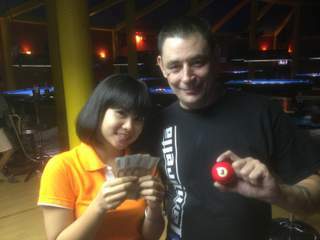 TUESDAY 10 BALL GRAND FINAL : ROLAND WINS. 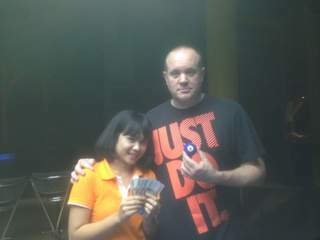 Congratulations go to Filipino Hotshot Roland Garcia (A+20*) for winning our Tuesday 10 Ball Grand Final for Season 12 on Saturday night. 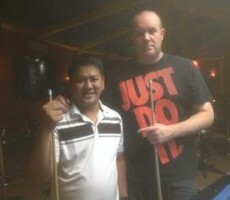 From the maximum entry of 16 players, he defeated his friend and practice partner, Scott Cooney (A+20*) from England in the final to collect the 1st Prize of 10000 baht. Roland played some superb pool throughout the event, showing a very high level of consistency as always, and was a worthy winner. 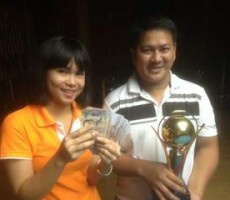 After losing his second match of the evening, he then won 4 consecutive matches to lift the trophy. In the final he raced into a 4-0 lead while Scott could only sit and watch, and although Scott won four of the next six racks, Roland produced a “break and run” in rack 11 to seal a comfortable victory by 7 racks to 4. 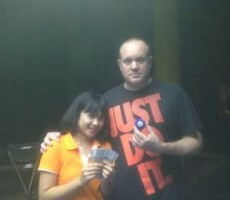 Consolation for Scott was the Runners-Up Prize of 5000 baht. 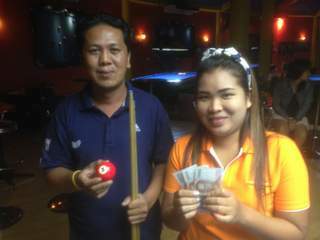 Thailand’s Preecha (A+20) and Jimmy Mole (A+7) from England both played well to reach the semi-finals, taking home 3000 baht each. 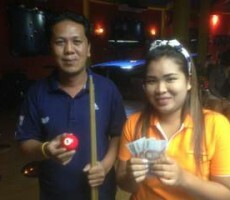 Preecha easily won his first three matches, dropping only 3 racks in the process, before losing out to Scott in the Last 4. Jimmy also won three consecutive matches to cruise into the semi’s, where he would come unstuck against the eventual winner. 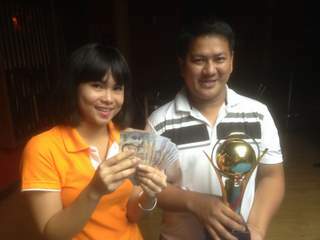 The other money winners on the evening were the Japanese duo of Hiro Mori (A+5) and Kazunori Sekimata (A+3), John Weber (A+3) from Israel, and Joe Stark (A+3) from Germany, who all collected 1000 baht for reaching the Last 8. Joe’s handicap now moves up to A+4 as a result.